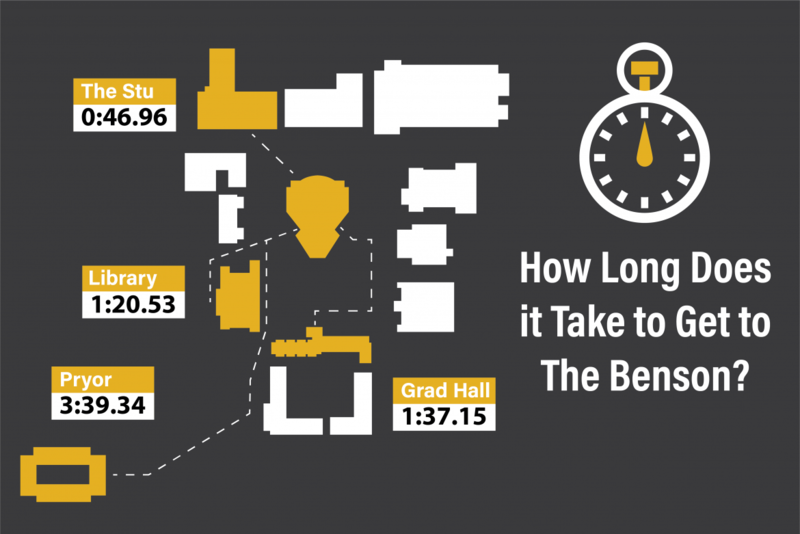 Have you ever wondered how long it truly takes to get to the Benson? Wonder no more. There is no surprise that this is the closest location to the Benson, which ensures plenty of time to beat the line and grab a chicken biscuit before chapel. Shout out to all the studious students who get up early enough to go to the library before chapel. You have an almost direct path to the side door of the Benson auditorium, which will give you plenty of time to cram for that test you have in two hours. Being the closest dorm on campus to the Benson, you have it made. Luckily, you can use the side door to ensure a speedy walk to the Benson. Use those magical side doors and you will never be late for chapel again. After leg day, the two-minute walk may seem like too much work, but I promise you, it is not as bad as you think. Congrats girls, you live in the most convenient dorm for girls on campus. You may be tempted to sleep in a couple extra minutes and you know what, you deserve to. Kendall is one of the most central dorms on campus, which makes getting to chapel a breeze. Pro tip: if you are feeling adventurous, you could make it to chapel in one minute and 30 seconds. Ask a friend. Sears Hall may be the newer freshman women’s dorm, but Cathcart is closer to chapel. You can decide who is luckier. Cut through Allen Hall to make your chapel run the most efficient. Once again, put those side doors to work. Once you get past the excessive number of grasshoppers surrounding the side doors, the best path is behind the Administration Building, down the side of the Ezell Building and behind the library. You will want to cut across the Pattie Cobb parking lot and through the Front Lawn to safely and quickly arrive to the Benson. Make sure you go out through the side door behind Cathcart Hall and through the Front Lawn. Watch out for brave squirrels darting in front of your path. For all you aspiring athletes who “do not have time” to workout, the jog to chapel can be a great morning exercise. You may think the quickest path is through the crack, between the American Studies Building and Kendall Hall, but the quickest way is actually through the side door. Follow the path in front of the American Heritage Building and Student Center. For the fastest route to chapel, cut through Allen Hall and the Graduate Hall parking lot to make a sly entrance through the side door of the Benson. Since this is the furthest girl’s dorm, your best bet is to cut through the crack between Stephens and Kendall Halls, past the Bell Tower – watch out, there are some bricks missing – and through the side door of the Benson. This one may be a surprise, but it does not take as long as you think to get to the Benson from Midnight Oil. The secret is to cut across the American Heritage Building parking lot and between the Student Center and McInteer Bible and Missions Building and voilà, you are at the Benson in record time. Everyone loves a good ol’ cup of joe in the morning, but make sure you leave with plenty of time to get to chapel. The quickest path is to walk through the First Ladies Garden and cut through the Pattie Cobb Hall parking lot to the Front Lawn.